An extract from a video I’m watching shows a familiar scene: ranks of black-clad riot police clutching shields and batons attempting to protect the entrance of a building as young protestors waving banners mill around, chant slogans, and make occasional jousting attempts to break police lines.1 Members of both sides of the dispute get pushed around, beaten up, and trampled, and as darkness falls things escalate, cars burn, and the police pepper the crowd with teargas and rubber bullets. Scenes like these have become the everyday stuff of news reports from around the world, a double-edged leitmotif used to signal on the one hand “youth out of control” and on the other “democracy under threat”: a Chinese man and a tank, an Arabic youth in a Paris suburb, a skin-head. Images of civil unrest and disobedience have become generic, and as such they enter the terrain of the visual cliché, and in some cases even the icon. In media, terms this particular film can be seen as a minor document. However, for me, the value of this film lies in its location, its date, and the specific demands of its protagonists. Shot in black-and-white video in 1980 in Zürich by members of the video collective Videoladen Zürich (Videoshop Zürich), Züri brännt (Zürich is Burning)2 is a poetic, and at times irreverent documentation of how a loose group of young artists, filmmakers, playwrights, poets, radio DJs, musicians, groupies, and hangers on, set about making space for their own cultural visions and expressions; space, or as they referred to it “Freier Raum” that proved hard to come by and once occupied, proved equally hard to hold onto. As it became clear to them that their “culture” was perceived not as the right kind of culture, one thing necessarily lead to another, resulting in a season of violent public protest against what (in relation to its European neighbours) represented an extreme state of cultural conservatism. Few outside the country know anything about the so-called “youth unrest” that the film documents. The riots shook Zürich in 1980 and kicked off demonstrations in the nearby cities of Basel and Bern that lasted until Zürich begrudgingly agreed to support rather than repress the activities of the younger generation. In general Switzerland seems willing to forget that only twenty-five years ago its citizens were forced to literally fight for artistic freedom. When a librarian at the city’s social archive encouraged me to look at Zürich is Burning, I was transfixed by the importance of this overlooked “footnote” to Zürich’s current cultural importance.3 The archive, I discovered, was an excellent place to set about understanding the complexities of the city I had just moved to, and to get behind the veneer of subdued respectability, which dominates the international perception of Zürich, and indeed of Switzerland as a whole. They were no longer willing to stand about and watch history pass them by. They wanted to play a part, and more importantly, they wanted to do so on their terms. Once violence broke out, it became clear just how serious the demonstrations were being taken, and just how reactionary their opponents were willing to be in their response. The standoff took on a certain theatrical aspect, in which the artists sought to make clear just how uncompromising they in turn could be. In answer to the initially patronizing concessions offered by the city in exchange for a “ceasefire,” the movement played a trump card with the slogan “Wir wollen Alles” (We Want Everything). For those who were essentially not willing to share anything, this was a hard call. Although they didn’t get everything, the group of artists that came to be known as Zürich’s Freie Szene got a lot. Most importantly they forced the city to recognize that youth culture was not only an integral part of the city’s cultural life, but also one that needed to be left largely to its own devices. The frei in the Freie Szene could be adequately translated as “independent” and indeed the centre of this scene’s activities in the 1980s could be seen as a forerunner of the “independent spaces” that followed; artist-led and organized with an allergy to all things commercial and hierarchical. A large complex of former industrial buildings on the side of Lake Zürich, at the indefinable border between the city and its suburbs, became the city’s first officially sanctioned “autonomous youth centre.” Unlike its forebears, which had been closed by the police, the Rote Fabrik (Red Factory) was legal and guaranteed a remarkable level of freedom in its activities. In addition, the city provided financial support to the building’s transformation into a venue for theatre, dance, music, art, and associated cultural life. The complex included from the outset forty studios for artists and a large exhibition space, initially entitled the Hallen Junger Schweizer Kunst6 and later simply the Shedhalle. The Rote Fabrik was just one of many of the initiatives that sprung up in the new spirit of tolerance following 1980 and for many Zürichers the 1980s as a whole are remembered fondly as a time when a genuine alternative culture boomed. This era of free parties, demos, and punk concerts have been described as a time when the city invented a new part of itself, a young, anarchic, and finally free Zürich, existing, flourishing even, under the disapproving noses of those in charge. So what happened to the freie szene? What is left of this germ of artist-led otherness some twenty-five years down the line? The Rote Fabrik still stands in its original place and enjoys the same freedoms its founders fought for. It is still programmed by young people and has a tradition of employing alternative thinkers, although these days they see themselves as young professionals rather than anti-authoritarian radicals. It is an important place to visit and still a refreshing alternative to the Bulgari excess of the city’s opulent Bahnhofstrasse, but hardly “alternative” in the earlier sense of the word. The subtitle to their exhibition on colonialism, Relationships between Tourism, Neo-colonialism and Migration, is exemplary of the Shedhalle’s approach since the mid-1990s, giving an idea of the academic terms of reference that the space uses in its outward communication of its concerns. The exhibitions are without exception thematic and the chosen themes, though approached and illustrated through the work of artists are never art-specific, read rather like an A to Z of cultural studies keywords. The artists and others who have collaborated on the Shedhalle’s output are at ease with this inherited terminology. For many, writing and leading discussion is central to their work. They are also at ease with a thematic working process; for the most part they define their practice through its concerns not its medium. So leafing through the file of press releases of the past year’s exhibitions in the space, one reads not of expressive brushstrokes, sculptural qualities, or use of colour, but of critical self-manifestations, relational processes, and interdisciplinary approaches. The Shedhalle’s program has been instrumental in the gestation of a now much more widespread critical curatorial approach in which the politics of display are as much under consideration as works of art, and the aim of exhibition is not only to put art on display but also to lead artists and their publics towards participation in a constructive discourse. Upon moving here I became a regular visitor to the Shedhalle and a fan of its intricate and time-consuming exhibitions. On the one hand, I guess I saw it as supporting my own concerns (in my position as a member of the professionalized cultural left) and, on the other, I enjoyed the laid back and unpretentious context it espoused on the lakeside, on the outskirts of town. When I found myself a couple of years later in the Sozialarchiv looking at material from the 1980s and the pre-history of the Rote Fabrik, I mentally sketched a red thread from the Freie Szene to the “independent” voice of the Shedhalle today. As I sat in the space with a group of artists and thinkers thrashing out the questions of Europe’s introduction of arcane anti-terror laws, I saw that we are direct descendants of the youth movement in its anti-conservative stance and its own call for freedom of expression. Until recently I failed to ask a most crucial question, if we were the descendants, where were our forebears? The members of the Freie Szene are only ten or fifteen years older than my generation, so why wern’t we meeting them at the Shedhalle’s openings and events? A recent exhibition at the Shedhalle, staged by several key figures in the Freie Szene, has gone some way towards answering these questions, and the answers throw fairly dramatic light on the issue of what role artist-led culture plays in Zürich today. The exhibition and the initiative it spear-headed was entitled Raum für Räume (Space for Spaces), the result of over three years work by Zürich based artists Susanna Nüesch, Barbara Roth, and Martin Senn. The artists started by rephrasing a question they addressed so actively in the 1980s, revisiting the still resonant issues of space and independence. They were spurred into action by the observation that many artists in Zürich were having trouble showing their work, particularly those working without commercial representation and also, judging by the general age of the artists involved, those who are no longer perceived as young and upcoming. They reasoned that the demands of the Freie Szene had in some way been eroded over time, that spaces for independent production were once again beyond the reach of those who really needed them, and in hindsight, those who had been instrumental in creating them in the first place. 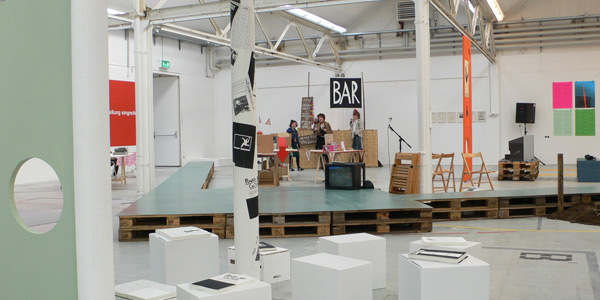 Using their local political connections they began their initiative by securing an exhibition in the Shedhalle, in which they exhibited the works of over sixty artists giving each of them one square meter of space in which to show their work. The exhibition was planned before the appointment of the incoming curatorial team who were, quite reasonably, surprised to be asked to accommodate it given that they were employed to run a programme that the planned exhibition was neither a part of nor complimentary to. In the end though, despite the state of conflict, the exhibition went ahead and Sönke Gau and Katharina Schlieben chose to organize a discussion parallel to the show with the aim of addressing and debating some central questions about the nature and positioning of Zürich’s “independent scene” today. The attitudes expressed in the discussion, and the premises of its organisation in the first place, firmly shatter any romantic illusions I might have had about solidarity between the 1980s anarcho-generation and that which raised its head in the socially-engaged 1990s and continues in this vein today in the mid-2000s. I met with the two curators of the Shedhalle, spoke with friends who had exhibited in the exhibition, and quickly found that none had come away unscarred from the experience of Raum für Räume. Two distinct versions of the same story seemed to clash against one another, the two sides unable to accommodate each other due to the incompatibility of their methods and languages. Several of the artists present voiced the opinion that the Shedhalle had become professionalized to a point of impenetrability, that the space had in some way been taken away from the artists who set it up, to be used for a kind of art they could not support. Despite the fact that many of them had studios in the same building, they felt increasingly excluded, and the gap between them and the space had reached a point of antagonism. The curators argued that the space’s history told a different story: the artists were instrumental in inviting curators to run the program in the mid 1980s, the first curators helped build the space with the artists, and that the development of the Shedhalle had always been guided by internal and democratic processes to which the artists in the building were party. The curators, working from their well-meant interest in discourse, had hoped that the discussion might provide a forum for addressing the situation, discussing the issue of exclusion as a broader feature of the artworld as a whole and imagining solutions. But the artists of the Freie Szene, also loyal to their roots, saw the occasion as an opportunity for ritualized protest, booing down some of the speakers and refusing to play by the rules of such an imposed “constructive” dialogue. art scene and the histories that inform it at present reveal these conflicting understandings of what form artist-led culture should take, what agenda this culture should serve, and what languages it should speak. ↩ 1. This article is the first of a two part piece that was originally published on midwest.org.uk. ↩ 2. Videoladen, Züri brännt (Zürich: CH-Dialekt, 1980). ↩ 3. Schweizerisches Sozialarchiv, Stadelhoferstr.12, Zürich. ↩ 4. A good example being the aggressive police response to the “Luft und Lärm” gathering for better air-quality in Zürich in May 1980. ↩ 5. Translated from German by the author. Barnaby Drabble is a curator and writer based in Zürich. He is currently curating the forthcoming Oberschwaben Triennial of Contemporary Art (2007).